Ödön Lechner's independent pre-modern architecture is part of the Tentative list of Hungary in order to qualify for inclusion in the World Heritage List. On my way back home from Pécs I had a few hours to spare in Budapest. As I had been to the Budapest WHS already, I had a look at Hungary’s Tentative List for something else worthwhile to visit. And yes: there’s another site in Budapest waiting to be included in the WH List. Ödön Lechner's independent pre-modern architecture comprises 5 buildings, of which 4 are in the Hungarian capital. Given my limited time and the freezing weather, I focused on the 2 easiest of this batch: the Postal Savings Bank and the Museum of Applied Arts. Ödön Lechner was a Hungarian architect of the late 19th and early 20th century. Coming from a family that owned a brick factory (which engrained a love for ceramic materials), his artistic education occurred in Paris and London. He lived in both cities for a few years, and there became acquainted with Art Nouveau and the Arts & Crafts Movement. Returning to Hungary and inspired by these modern developments, he developed his own particular style – hence the “independent” in the TWHS name I guess. It also relied heavily on the Hungarian nationalist notion at the time that their roots lie in Asia (Persia, India) and not in Europe. The Postal Savings Bank is situated in the city center of Budapest, just a few minutes’ walk from the landmark Hungarian Parliament buildings. It’s an upmarket area with many large classicist buildings. This bank stands out in its street because of its Art Nouveau and vernacular accents, although not as much as for example Gaudi’s works in Barcelona (to whom he is often compared). 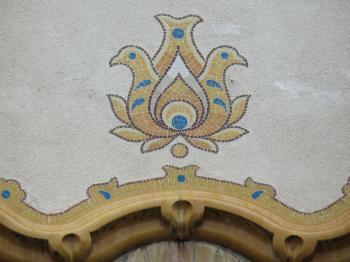 The building has an almost textbook classic Art Nouveau entrance. The vernacular accents mostly consist of birds, bees and flowers. It is now part of the Hungarian National Bank and I am not sure whether it is open to the general public (I visited on a Sunday so it was closed anyway). The second Lechner building that I visited was the Museum of Applied Arts. This lies close to Corvin Negyed metro station, also still quite in the city center of Budapest. It is immediately visible when you’ve exited the metro at ground level: this is a large stand-alone building, with a distinctive green and yellow roof. In a way it resembles the Chhatrapati Shivaji Terminus: in English texts that I read beforehand the British colonial link is pointed out (he apparently was influenced by the Indo-Saracenic style as well). The museum is currently closed for renovation. Is it in preparation of a successful WH nomination perhaps? It’s a pity because it provides the easiest access to the interior of one of Lechner’s buildings. Fortunately they have left the iron fence open to the formidable main entrance of the museum: a colourful masterpiece of the use of tiles and ceramics. The official description accompanying this Tentative List entry feels like it was written by a Hungarian nationalist. Lechner apparently “created outstanding cultural treasures that demand the attention of all humanity” and was “anticipating the great individuals of world architecture”. Lechner clearly is of great interest for Hungarian architecture, although he has been despised also for a long period in the 20th century. One wonders if his particular route is enough to warrant a WH listing: he has not inspired a global following and also hasn’t left much of his footprint outside of Hungary (the “Blue Church” in Bratislava is a notable exception). This nomination includes five buildings three of which are located in Budapest. I only visited two of the three in Budapest and found them both impressive from the outside. I also entered Lechner's most famous building - the Museum of Applied Arts - and found nothing special about its interior. I also know Lechner's Blue Church in Bratislava and find it a shame it is not part of this proposal. I think it too is one of his finest works. Lechner can be clearly associated with the Judgenstil/Art Nouveau/Secession movement of the late 19th century. Nonetheless, I think he still retained a personal style that be recognized when admiring his buildings. This said, I don't know how influential or exceptional he was in the history of architecture to make a special nomination for him alone.